Donald Wilfred was born on Febrnary 10, 1959 at the Erickson Hospital. He is the eldest son of Wilfred and Veronica Vaughan. Don attended Erickson Elementary and Erickson Collegiate to graduate in 1977. He then attended the University of Manitoba to receive the 2-year Agriculture Diploma. On August 28, 1982, he married Donna Lynn Prokopchuk from Sandy Lake, MB. Donna was born January 9, 1962 in Winnipeg, to Donald and Mary Prokopchuk. At the age of 5, her parents moved to Lynne Lake, MB. When she turned 9 she moved to Sandy Lake, MB to live with her Aunt and Uncle, Mary and Joe Hnatiuk. Donna attended Lynne Lake and Sandy Lake Elementary Schools and then graduated form Erickson Collegiate in 1980. Don's primary occupation was farming with his dad. He drove the school bus for approximately 15 years. As of October 1999, he still farms with his dad, but quit driv­ ing the school bus and accepted the position of Maintenance Supervisor for the Erickson and District Health Centre. He is also very active with the Fire Department and Ambulance Service. Spare time is spent with his two sons, whether it be camping, fishing or hockey. Donna started work at the Erickson Co-op and then moved over to the Erickson Credit Union. She is presently employed by the Royal Bank of Canada in Erickson. In her spare time she does needle work. Derrick Blaine, born July 8, 1986 in Minnedosa Hospital, enjoys hockey and curling. Devin Marc, born November 2, 1989 in Minnedosa Hospital, enjoys hockey and fishing. Canadian Artillery and, after 10 years, he transferred to the Canadian Forces Medical Service. During his 30 years of service he served in Shilo, MB, Camp Gagetown, NB, Ottawa, Oakville, ON, Calgary, AB and Winnipeg, MB. Vic retired in May 1985 with the rank of Major. 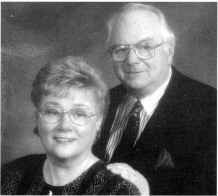 In 1960, Vic married Arlene Butterfield, the eldest daughter of Margaret and the late Bill Butterfield of McCreary. Arlene received her education at Rosamond School in McCreary. She took nurse's training at Misericordia Hospital in Winnipeg and graduated in 1960. Her nursing career took her to various cities across the country where Vic's postings occurred. After Vic retired from the Forces, they moved to McCreary, where Arlene was employed as Director of Nursing of the McCreary/Alonsa Health Centre. In 1989, Vic accepted the position as Administrator of the new Erickson District Health Centre, where he was employed for 5 years. Following retirement, Vic and Arlene have become involved in many activities and organizations in the community. They chose Erickson as the ideal place to retire. Vic, at present, is a member of the Town Council. Vic and Arlene are the parents of two children. Bruce, born in 1962, is married to Jan Walker. They are both grad­ uates ofthe Veterinary College in Saskatoon, and at present operate the Shoal Lake Veterinary Clinic. They are the parents of five children: Geordie, Eddie, Ben, Reggie and Heather. Wendy, born in 1964, received her Bachelor of Nursing Degree at the University of Manitoba. She moved to Dallas, Texas shOIl1yafter graduation, and went on to receive her Masters Degree in Nursing. Wendy is currently employed as Director of Psychiatric Emergency Services at Parkland Hospital in Dallas. Vic and Arlene will celebrate their 40th Anniversary in the fall of 2000. To continue the history of the Sidney Waldron family, Sid and Joyce (nee Burkett) have lived continuously in Winnipeg since 1966. In 1985, Sid retired early from his career as a mechanic at Case Power and Equipment and, in 1989, Joyce retired from her career as a nurse at St. Amant Centre. We sold our home in the St. orbert area in 1994 and purchased a condominium in the St. Vital area. Our lifestyle changed slightly, but we remain active and interested in various community and church activities. Volunteering has been a very rewarding activity. Edith, our oldest child, lives in Morden, MB with her husband, Laverne Lovett, and two children: Allysa, eleven years old, and Nicholas, eight years old. Edith has main­ tained her nursing career in the Morden District Hospital. She is active in children's activities, sports and the United Church.